Thanks to all who entered the #LawRevHaiku contest! August through September 25th 2016 Scholastica ran a Twitter contest for the top three law review haikus using the hashtag #LawRevHaiku. We want to thank everyone who participated in the contest! There were many excellent entries and the Scholastica team had a tough time choosing the winners. We hope you’ve enjoyed this opportunity to embrace the poetic side of submission season. We had a lot of fun reading through everyone’s tweets! Profs at mercy of students. Then the piece's true topic. Wondering what other haikus were submitted? Below is a Storify of the last 10 days of the contest. To see all entries just type #LawRevHaiku into the Twitter search bar. 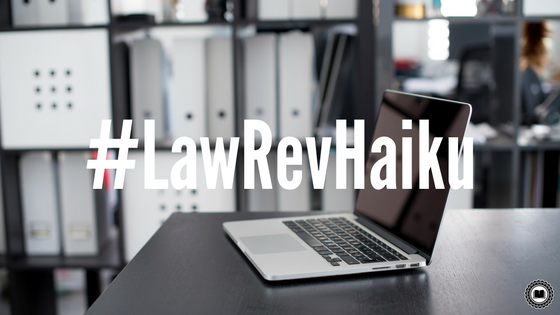 Thanks again to all who entered, there would be no #LawRevHaiku without you! The second in a series of data-driven law review posts, this post provides insight into expedited decision requests. The third in a series of data-driven law review posts - this post focuses on when decisions are made by law reviews. Here are 3 super easy ways your law review can make the article selection cycle a little more bearable for authors.